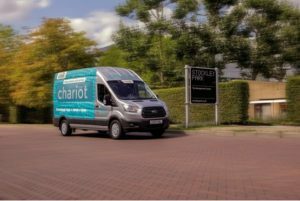 Ford has expanded its Chariot ride-sharing service in the UK, as it looks to expand the operation in several European countries. The service has expanded to cover the Stockley Park business hub in west London, which plays host to more than 7,500 employees from a variety of major businesses including IBM, Apple and BP. Chariot, which began operating in London earlier this year, is a ride-sharing minibus service that initially aimed to connect commuters living and working in areas underserved by public transport with nearby transit hubs. The new Chariot route is a collaboration between Chariot and award-winning sustainable transport group, easitNETWORK. The service is available for commuters travelling between Stockley Park – near to Heathrow Airport on the outskirts of west London – and Hayes and Harlington Station, a major transport hub served by TfL Rail, National Rail and, from next year, the new Elizabeth Line. The free easitSTOCKLEY PARK Shuttle Bus operates during weekday morning and afternoon peak times, taking a direct route between Hayes and Harlington station and the Stockley Park campus. A further service – the Lunchtime Shopper – connects Stockley Park and the nearby Intu Uxbridge Shopping Centre, providing an opportunity for staff to relax and run errands. Chariot offers a smartphone app that lets bus users book a seat and track their vehicle’s progress in real time, with 14-seat Ford Transit minibuses operating on the route. The service begins this week and will be free to anyone with the Chariot app installed on their smartphone until 1 December, after which it will only be available to Easit members.